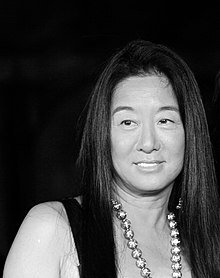 Vera Wang (Chinese: 王薇薇; pinyin: Wáng Wēiwei; born June 27, 1949) is an American fashion designer. She was born and raised in New York City. Her parents were Chinese. She is based in New York and is known for her wedding gown collection, among other specialties. After her graduation in 1971, Wang began working for Vogue Magazine. In 1972, she was promoted as the senior fashion editor. She left Vogue in 1987, to join Ralph Lauren as the design director for accessories. Wang established her own label "Vera Wang" in 1990, in New York. ↑ Donadio, Rachel (2017-02-27). "Vera Wang's Paris Love Affair". The New York Times. ISSN 0362-4331. Retrieved 2017-10-18. ↑ Bhattarai, Abha (2017-08-10). "Macy's, Kohl's earnings are less terrible than feared". Washington Post. ISSN 0190-8286. Retrieved 2017-10-17. ↑ "WSJ. Magazine April 2015: The Columnists". Wall Street Journal. 2015-03-27. ISSN 0099-9660. Retrieved 2017-10-17. ↑ Binkley, Christina (2011-12-15). "Beyond Bridal: Vera Wang's New Look". Wall Street Journal. ISSN 0099-9660. Retrieved 2017-10-17. ↑ "Vera Wang". Vogue.com.au. 2010-02-08. Retrieved 2017-10-18. ↑ "#TBT: An Exclusive Interview with Fashion Icon Vera Wang". That's Online. Retrieved 2017-10-18. This page was last changed on 6 August 2018, at 23:37.